This carte-de-visite is part of a series called “Costumes de Suisse,” published around 1869 by French photographer Adolphe Braun (1812-1877). Braun’s studio was in Alsace, France, in the village of Dornach, near the borders with Germany and Switzerland. Each photo in the series presents a young woman in a traditional costume from a particular Swiss canton. 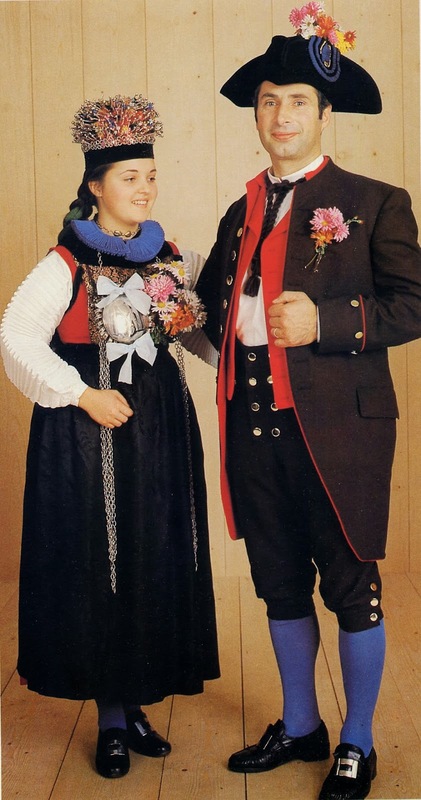 This photo is labeled CANTON DE FRIBOURG (PARTIE ALLEMANDE), meaning it presents a costume from the German area of the Canton de Fribourg. When I saw this carte for sale online, my eye was drawn first to the young woman’s elaborate headdress, then to her dress, then to the lace in front of her. Then my gaze drifted up to the mirror, and I was surprised to see a man’s figure there, undoubtedly that of Adolphe Braun. His face isn’t visible, but his torso is neatly framed by the oval mirror. This was no accidental self-portrait! Portrait of a woman wearing a dress typical of the canton of Fribourg, Switzerland. She stands in front of an open suitcase on top of an intricately carved dresser or sideboard. A lace veil with a dot pattern spills over the sides of the case, and the woman rests one hand on the top and the other on the bottom. A mirror with an ornately carved frame hangs on the wall above the suitcase, and a painted backdrop that hangs in an open doorframe behind the woman depicts a valley landscape and the surrounding mountains. Canton de Fribourg, by Adolphe Braun. Digital image courtesy of the Getty’s Open Content Program. Some age-toning removed (partial de-saturation) by the author. Detail, Canton de Fribourg, by Adolphe Braun. Digital image courtesy of the Getty’s Open Content Program. I’ve looked through the other 26 images in the Getty’s set of Costumes, and Braun doesn’t seem to appear in any of them. One contains a mirror, but nothing is visible in it. What was special to him about this one, if anything? Did he have a personal connection to the Canton de Fribourg? Or was he just having a little fun, stepping into the frame for once, instead of always remaining invisible, only a name on a card? Do you have an approximate date for the card? The first, fanciful thought that came to me was that he might have just finished reading “The Picture of Dorian Gray,” which was published in 1890. Or, his image there might have been nothing more than a sly joke. And good for him. We need a little more fun these days, even if it’s old fun! Kind of like what Alfred Hitchcock used to do? Very interesting young lady in an amazing dress and a headdress. My attention was immediately attracted by a chest and a mirror. How much time does the master spend on making such a beautiful things? Amazing work! Beautiful photo with an interesting little mystery associated with it! I love the set of photos at the Getty. It shows that art curators aren’t always the most observant folks. Or maybe what they look for is different than what the rest of us look for in a piece of artwork. In my research, the Getty’s website has frequently been the best place to find information on early European photographers not working in the UK. (The NPG in Britain is the best for the UK.) I was really impressed by how much attention the Getty had given to Braun’s work. They have 712 of his photographs! (Most are probably landscapes.) I was surprised the cataloger didn’t notice the figure in the mirror, but they couldn’t notice every detail in every image. Thanks, Shayne! I totally missed it until Brad pointed it out! I do love the mystery of the photographer in the mirror! Just behind her to the left is a rosary hanging upon the wall. I say rosary because it has the same form and count yet rosaries usually begin at their base with a crucifix and this one seems to have a medal instead. I wonder why it’s there. Wonderful photo! I’m so glad you noticed the rosary, because I didn’t know what it was! It’s definitely there for a reason. It may be an allusion to Catholic heritage, but that wouldn’t explain the medal in place of a cross. Great eye, Suzanne! Ever the romantic! ❤️ You tell a convincing tale, dear poet! Now I won’t look at this image the same way again, which is totally fine. 😊 About the medal or token on the rosary, I zoomed in at very high resolution and could see nothing there–it looks completely blank. That could mean that the design on the surface of the token is very subtle and the camera didn’t pick it up. My guess is that it doesn’t have a cross on it, at any rate. Hope you and the pups are having a nice weekend so far! Reading the discussion between you and Suzanne about this mysterious photo, I’m drowned in thoughts. I like the idea of the photographer staging a little “cameo” appearance in this photo, as a previous commenter said, in the style of Alfred Hitchcock. Also I LOVE this woman’s shoes. Cameo is the perfect word for it. The mirror even has the shape of a cameo locket. I’m glad you noticed her shoes. They look much more practical than the rest of her outfit! Fascinating photo, Brad – also its ‘sister’ photos on the Getty site. The image in the mirror is either deliberate and of the photographer, in which case he’s either done it with mirrors or cleverly added it in a vintage version of post-production as he can’t have been in two places at the same time – facing her to have his image in the mirror as he’s photographing her… or else it’s of someone else in the room – possibly an assistant, maybe someone in charge of some of the lighting? The other version on the Getty site is different in several ways of which I’ve noticed the following: her eyes and hand are in a slightly different position, the reflection in the mirror is more upright than in your photo, the striped part of her dress (possibly a ribbon or wrap?) is missing in the other version – hidden behind a fold of the skirt or completely absent. There is more lace hanging down in the Getty version. I hadn’t realised that she was holding open a case – her hand resting on the edge of the lid – presumably meant to be a bridal trousseau. How interesting that the long vertical stripe on her dress in my version of the photo is completely absent in the Getty’s version. I hadn’t noticed! It could be accidental, but my guess is it was intentional; Braun may have been unsure whether the dress would look better with the stripe or without. You have an amazing eye for details!